The Whalley monks originally came from Stanlaw Abbey, near Ellesmere Port. They had wanted to move for some time, because of the unsuitability of the Stanlaw site. Stanlaw Abbey had been subject to repeated floods over the years and the landscape had progressively become more of a swamp. In 1287 the church tower had collapsed and in 1289 the abbey had also been devastated by fire. In 1296 the monks finally got their wish and moved to Whalley and built a new abbey there. There was little brotherly love between them and their fellow Cistercian Monks at nearby Sawley Abbey and the two houses soon fell out. 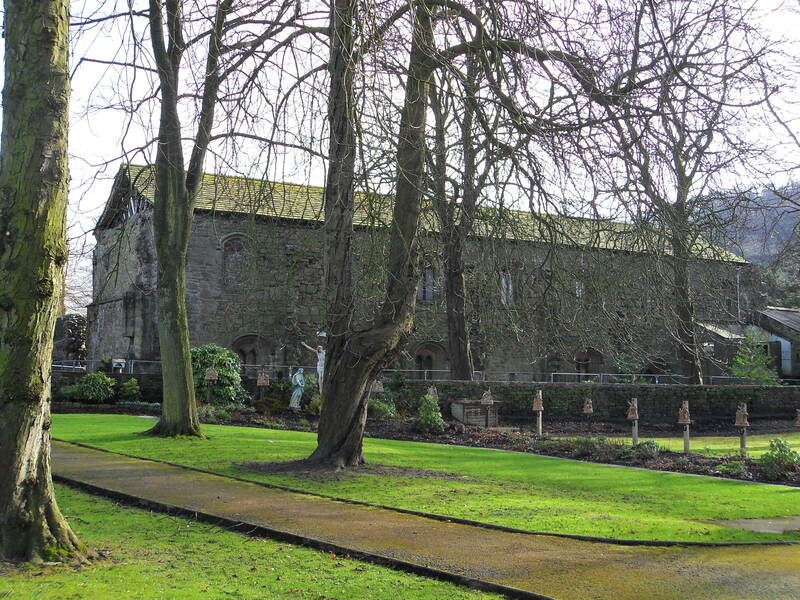 Today Whalley Abbey is split into three parts, with three different owners. The bulk of the abbey is owned by the Church of England and they charge a small entrance fee. The nearby large free-standing gate house is owned by English Heritage and can be looked around at no charge. The lay brothers dormitory is owned by the Catholic Church and good views of it can be obtained from the road outside and from the churchyard. The far side of it can be seen once you are inside the abbey itself. There is ample parking space on the road outside the abbey walls. If you park here, don’t go straight into the main site. Instead walk just a couple of minutes down the road to view the impressive free-standing gatehouse. 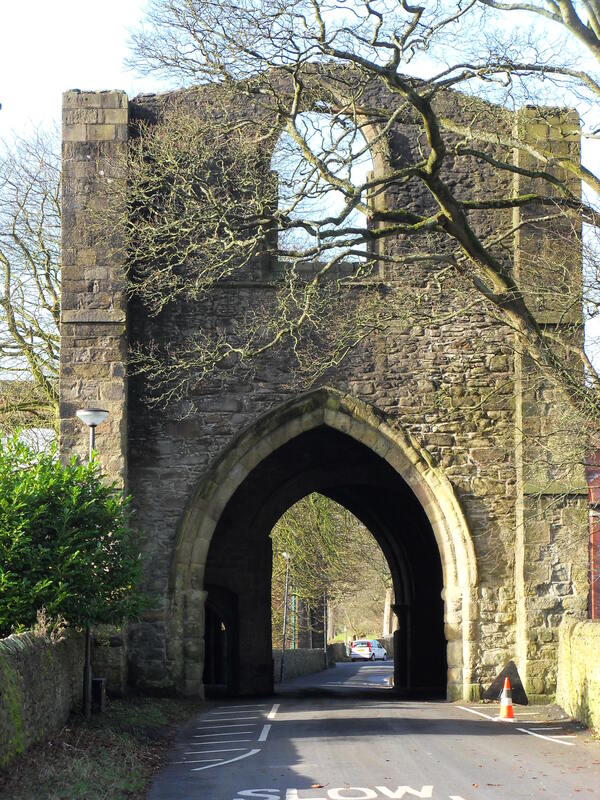 Take care, because traffic can drive right through the arch of the gatehouse, although the road is usually reasonably quiet. This is one of the first parts of the abbey to be built and it would control traffic into the area. The monks here could give food to the poor and receive visitors to the abbey. Once inside you can clearly see two doorways – one to allow the passage of horses and carts, the other for people on foot. The vaulted ceiling is an impressive piece of work, and above it is another floor that may have been used as a chapel for visitors to the abbey. Retrace your steps back up the road to the main abbey site. On your way you can see on your right a rather grand house that was once a farm house (now a presbytery). Behind it lies the lay brothers dormitory. There is no public access to it, but it can be easily viewed from the road and catholic churchyard. The lay brothers would carry out the domestic and farming duties of the monastery. It’s very rare for such a building to survive intact, with its roof on. It only survived after the monastery was abolished because it was used as a cow shed. It looks in a sorry state today and it would be wonderful to see it restored. The window details are of particular interest. Heading back up to the main abbey entrance you can see a second gate house. Enter through this and pay the fee. Once inside you can see the grounds are quite extensive. To start with, head for the foundations of the abbey church, which are clearly laid out. Of particular interest are the choir pits which have been recently excavated and restored. These would have amplified the monks’ singing, acting as resonating chambers. While in the abbey church, you can see where the whole site has been cut in two, by a wall through the green grass of the cloister. As you venture further in to the site you are able to see more of the lay brothers’ dormitory on your right behind the dividing wall. As you progress you can see the site has some substantial standing walls. These form parts of the vestry, parlour and monks day room. The reredorter (or toilet block !) is particularly impressive and the abbot’s kitchen is also quite substantial. When the abbey was abolished, the Assheton family bought it and built a Tudor house in its grounds next to the abbot’s lodgings. The exterior of the house can be viewed and it is now used as a conference centre for the Diocese of Blackburn. Parts of Whalley Abbey live on elsewhere today. The elaborately carved misericords (small folding choir seats that monks could perch on while standing up to sing) have ended up in both Whalley Parish Church just around the corner, and in Blackburn Cathedral. Some of the large abbey windows were reused and installed in Samlesbury Hall, not many miles away, and can be seen there today. One of its medieval bells can be seen at St Leonard the Less, Salmesbury and the abbot’s robes are in Towneley Hall, Burnley. 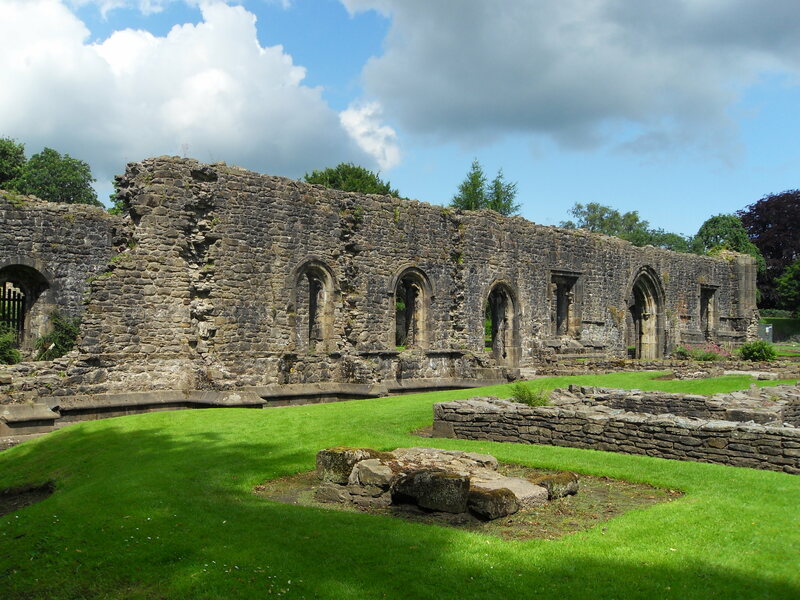 Whalley Abbey is a large site and there is much to see. The grounds are beautiful at any time of year, the gardens really adding to the whole experience. Whalley church is open on Saturday afternoons, and inside can be viewed the abbey misericords. Sawley Abbey, a smaller Cistercian house, is another wonderful medieval monastery.